From a secret location very close to Janet. Janet thought she was going to have an easy morning as the only thing planned today was swimming at KGH. Breakfast was done in time for Jess to take her to the gym for a Shuttle session and a little stretching. Janet was happy to get it over with and was for the pool. Sean, the PT from 4B was in the pool with us for the first few minutes and Janet took great delight in trying to splash him. She wasn’t successful but had fun trying then Sean gave us a few new exercises to do in the water and suggested that weight bearing in that right leg is really important. I put a five pound weight on Janet’s right ankle to see if that would help her keep it on the bottom and it did somewhat but there is so much tone in that leg I think we’d need fifteen pounds to keep it down and Janet wouldn’t be able to move it at all then. Overall the pool sessions were good today with the biggest smiles coming from targeting Sean and swimming on her own and the toughest part being walking and using her right leg. We had to stop by the Interior Health offices at Capri Mall for some administrative work then went to the food court there for a lunch of some decent Chinese food. We were pleasantly surprised to see our church friend Carol there with her group of senior single ladies out for the afternoon. The drive back to Connect was a quiet one as Janet faded and was actually snoring as we pulled into the parking lot. It was a fun evening together watching football while in the Standing Frame then watching The Voice with Humberto, Wes and Karl the rest of the night. Janet loves that show and even sang out loud to one of the songs, a good warm up for singing with John tomorrow. 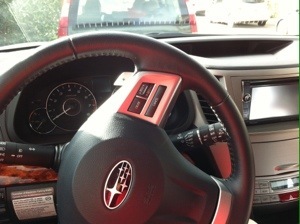 No one has guessed the model of our new car yet, some got the make so here is a more revealing picture. Praying for a deep and healing nights rest and lots more strength for that right leg. From a secret location really close to Janet. Since I’m staying so close to Janet I finally had a complete day with her. The morning was a bit of a scramble as I had some organizing of stuff that wouldn’t fit into the Big Steel Box to do before I could fit Janet into the car and go to church. This was Janet’s first ride in the new car since it became ours. She got in easily and was very comfy especially with the heated seats on. It is Fall here now for sure you know. Janet even commented on the smooth ride compared to the Vibe and even loaded down with stuff and her it was a fun drive in to church. 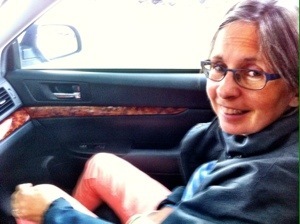 Here’s a pic of Janet in the new ride. Any guesses as to what car we bought? If you don’t know I’ll include a more revealing picture tomorrow. Of the car that is. Church was great with lots of lively easy to sing to music that Janet seemed to really enjoy and all the folks sitting around us this morning were very friendly even though we only know one of them. That’s the way it ought to be right? Following the service we did what a lot of Kelowna types do after church, head to the Mall. Janet was in need of shoes and long sleeve shirts so after lunch she got to shop. A successful trip it was that gave us time to do a little shopping for the new house as well. Not wanting to shop around much we trusted Sears Home to back up their product like they usually do and bought a bed and will go back for a fridge, wall oven and cook top unless the new kitchen plans change drastically. Janet was fading a little by the end of the Sears visit but it was good having her there to ensure the bed we bought wasn’t too high for her like our previous one was. Back at Connect Janet had a good phone conversation with her mom. I heard strong reminders of what she sounded like talking on the phone before the aneurysm especially in her laugh. Following the phone call she insisted on going to the gym before dinner so off we went and she had a good Shuttle session although I am noticing an increase in stiffness on her right leg. She said it hurt as I stretched her. Could be a lack of Botox, not sure. Janet tolerated the Standing Frame very well then after dinner helped sort out her clothes so she is winter ready and has summer put away. Sad. Since she didn’t get a nap this afternoon Janet was tired early tonight and asked to get ready for bed at eight o’clock. We had joined the masses and watched the finale of Breaking Bad before that, a show neither of us had seen before and even though Janet didn’t understand it she wasn’t turned off by it either. Maybe we can be a little more adventurous in our movie choices now as long as she can follow the story. 14A perhaps? After reading an entire chapter of Not a Fan to her, Janet was ready for lights out. I’m looking forward to her being able to discuss the book with others starting Wednesday night. Praying for a long and restful sleep tonight and lots of energy tomorrow. Clean out day at San Michelle Rd. took way longer than I expected and once again I didn’t get to see Janet until going on nine o’clock tonight. However, the job is done and we are officially in limbo land. 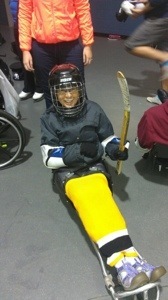 I got a huge surprise today when Jess texted me pictures of Janet all geared up to play sledge hockey. I’m so glad she agreed to go and try it! She did tell me it was cold and not much fun but agreed it wasn’t fair to not like it just because she was cold. Hopefully next time I can go and we can bundle Janet up a little more. Our short evening before bedtime was spent having dinner, she waited for me, and chatting before reading some Not a Fan. Janet asked to read it and still seems very interested in it. She seemed particularly bright to me tonight, commenting that “we missed going to church tonight” and conversing really well with me and Kieran. It was a fun if not short time. Praying for lots of quality time together tomorrow. This post will be even shorter than yesterday’s as I was only able to see Janet for a brief time tonight. This is also the last blog post from our San Michelle Rd. house. My day was crazy busy with packing and loading and waiting for movers to show up. Good thing they were late as I needed the time to pack the kitchen and bathroom. I can’t believe how much stuff was in those rooms. I also had the privilege of picking up our new car today. More on that some other time. With things running late I called Janet just after four to see how she was doing and tell her I’d be late. She had just gotten up from a nap and was a little confused as to what time of day it was. She thought she was getting ready for breakfast. She got quite upset when I told her I’d be late but there was nothing I could do about it. When I finally did get to see her it was 8:45 and she was watching TV with Humberto. Or I should say waiting for Humberto to leave so she could change the channel. She was in good spirits and loved the cookie I brought her and cautioned that maybe she shouldn’t eat it as she’d had cake for desert at dinner time. Janet had a hard time telling me anything else about her day, admitting she just couldn’t remember. Today’s short visit will be rectified over the next eight days as I will be homeless and spending a lot of time with Janet. She is very excited about that. Praying for increased strength and and a willingness to keep working hard. This is going to be short as its crunch time for moving and every minute counts. Janet went swimming at the Rutland Y today with Jess, Garrett and some other residents. She told me it was alright and kind of boring. When asked to elaborate she gave her stock answer of “its the same thing”. I think she enjoyed it more than she’s letting on and Garrett says there was some good stretching done along with walking against the flow in the River Run area. I got to Connect much later than my usual time and Janet was getting up from her nap. Dinner was served right away then we tried going for a walk in the last of the Fall sun. The weather has really changed in a hurry here, I saw frost on the rooftops yesterday morning and Janet had to wear her winter coat for tonight’s walk. I still had my shorts and polo shirt on but was cold by the end of the walk. In Janet’s words, “we’ve lost our summer”. 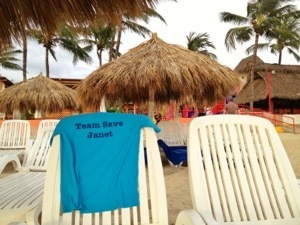 We are happy to see that Joel and Kiko are having a good time in sunny Mexico and even happier that Team Save Janet is represented there. That warmed us up. Have you got a picture wearing yours in some far away locale? We’d love to see it. After a little discussion Janet agreed to a workout on the Shuttle and then the Standing Frame with decent results from both. I’m hoping the team meeting next week allows for Janet to express her feelings about going to the gym so much and we can alleviate her fears. A lot of it still boils down to confidence and she’s saying more and more how her right leg doesn’t want to work. Bedtime reading is becoming a nice trend and we did that again tonight. Praying for lots of sleep tonight and a productive Friday for Janet and also for me. We are moving right along with our move and I almost brought Janet home this afternoon so I could keep packing but we also need to figure out the car situation and decided to use our time for that. Jess brought Janet in to KGH early this afternoon where I met them and took Janet to her appointment with Julie the splint lady. For the past few weeks Janet has complained of a little pain in her hand when wearing the splint for long periods of time and we’ve noticed her arm tightening up a little over that same period and even more so now that the weather has cooled. Julie was very impressed with the state of Janet’s hand and wrist and offered two solutions towards making the splint more comfortable. One would be to adjust the splint to allow for a more bent hand position, the other a different strap that would place more pressure on Janet’s fingers giving her hand a more relaxed position. Julie agreed that an adjustment to the splint would be a step back so we did the strap option. Once installed, Janet’s hand and wrist were in good positions and she said it felt fine. By seven o’clock tonight she said it was starting to bother her so maybe we just need to pace this thing out a little better. Julie encouraged continuing to stretch Janet’s wrist and fingers as much as possible to enhance the work of the splint. Too bad we no longer have a hot tub as that’s where I got the best stretches for her. Our visits to KGH often result in seeing someone that cared for Janet at some point and today we saw Chantelle and Kathy. Both worked as Physio Assistants back in the 4B days and Chantelle is the one who coached Janet during her first days propelling a wheelchair. They had lots of encouraging words for Janet and I and it was a blessing to run into them today. Hearing the things I tell Janet from other people gives those comments way more weight and Janet seems to get a kick out of people she has no memory of knowing so much about her. She’s finally starting to believe that there are/were lots of good people caring for her. Janet agreed to do more car shopping with me on the way back to Connect. She’s getting tired of all this as am I but understands the reasoning behind doing this now. We cruised a Nissan lot but saw nothing close to what we need then returned to the Subaru lot we visited right at the beginning of our search. I remembered that visit begin rushed and me being disappointed that Janet couldn’t get into the car I thought was going to be a good one for us. This time I was hoping they had an older model on site as they were lower to the ground and I was very confident Janet could get in. I was right but the only car of that style they had was a 2002 and I don’t want to go that old. While we were there and had time we decided to try the newer model again just for kicks. Janet got into it easier than anything else we’ve tried that wasn’t a pure car and I don’t know how we misjudged it so poorly the first time. The car we tried was taken in on a trade just thirty minutes before we got there and was by far the most fun car I’ve driven during our hunt. We may have a deal tomorrow! A very patient and tired Janet was happy we finally found something worthy and upon our return to Connect was hungry for dinner. It took a lot of convincing but I actually got her to go for a session on the Shuttle tonight and was happy with her performance. 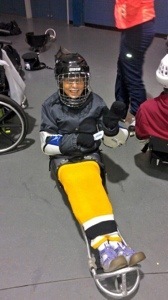 Despite the persistent neglect of her right leg it is getting stronger, at least for being able to push on the Shuttle. Sensing her tiredness and wanting her to be happy I gave her the night off from the Standing Frame and we enjoyed hanging out the Humberto, Wes and Kieran in the living room for an hour or so. Janet told me she liked hearing the “banter between all these people”. She will answer questions from people well but still won’t initiate a conversation but she is picking up on more of what people are talking about and keeping it in the right context. The busy day caught up to Janet in a hurry and she asked to go to bed at 8:30. She did want me to read to her for a little while and responded well to some questions on what we read. Today was a fun and productive day with Janet. Praying for healing of her right hand and arm and for lots of energy for a fun day tomorrow. After a busy day of preparing to move I got to Connect to find Janet lounging by the TV in the living room. She was eager to do something so my suggestion to go car shopping was readily accepted. Combine that with dinner out and a visit to the church before going back to Connect and she was all smiles. I was too late to get a briefing on Janet’s day so far and all she could tell me was she just had a shower and doesn’t like having them so late in the day as her hair doesn’t dry fast. She also mentioned going outside with Garrett for exercise but wasn’t able to give me details. Car shopping is proving as difficult as house hunting was. Janet is being very patient through this process and understands she needs to be there because if she can’t get in and out easily there’s no point in considering that car. We did find one SUV that she can get into but in reading online about it tonight there is quite a discrepancy between the gas mileage the salesperson told us the vehicle got and what the websites list. Not sure if that was an honest mistake or what. Still searching. Dinner was at Gengie and was “yummy” according to Janet. Her chop stick skills are improving and this was by far the least messy sushi dinner I can remember. We stopped by Trinity to check out the Small Group kick off event. The goal was to connect with a small group that I could take Janet to during the week for social and spiritual gain. We ran into Heidi who invited Janet to join her at She Life, a group that meets Wednesday evenings at the church and will be discussing the book we are reading, Not a Fan. Janet accepted the invite quickly and seems quite excited to try the group out. I hope to be able to help with the Tech Team while Janet does her thing so it could be win win. Don’t tell Joel. We made it back to Connect just before nine and Janet put away a bunch of her things I had brought out from the house then asked to get ready for bed so I could read to her a little. That was quite a different day together than typical and Janet seemed to enjoy it all. I wouldn’t want to keep her away from the gym or that busy too often but it was fun and we learned a lot and had nice chats with a few people. All good therapy. Praying for a healing night of sleep and a positive day tomorrow.